Texas Senator Ted Cruz has put forth a clever new plan for funding President Donald Trump’s expensive wall stretching across America’s southern border with Mexico. 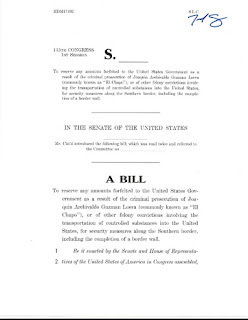 Aptly named "Ensuring Lawful Collection of Hidden Assets to Provide Order," Cruz’s bill would take seized assets from billionaire drug lords, like the notorious Mexican kingpin El Chapo, and use them to fund the wall project. Currently, "U.S. prosecutors are seeking $14 billion in drug profits and other assets from El Chapo," according to Axios. "They also routinely seize the assets of other drug dealers and traffickers." Known for his hit-squads and multi-billion dollar drug enterprise, El Chapo (Joaquin Guzman) was recently extradited to the United States from Mexico. The drug kingpin was imprisoned a handful of times in Mexico for his brutal crimes but, due to corruption and bribery schemes within the Mexican prison system, El Chapo managed to "escape" with the help of prison guards. That won't be happening again. Placed on U.S. soil, Guzman will likely spend the rest of his life behind bars at a maximum security federal prison.